Everyone loves a good sandwich. With so many options in LA, one of our go-to sandwich places is Jimmy John’s! We’re usually on the move between work, meetings, shoots and more, so we are always in need of lunch spots that are fresh, offer wholesome options, and most importantly, quick! That’s why Jimmy John’s is a favorite for us. They’re known for freaky fast service, and it’s not a joke. We can be in and out in less than 10 minutes, so it’s perfect every time we’re in need of a quick lunch on the go. They are a classic, and have everything you need in a traditional sandwich shop; natural meats, fresh locally purchased veggies that are hand sliced daily, and bread that’s baked fresh in-store every day. We heard they launched a new version of their bread made with 9 whole grains, and to say we were excited was an understatement. We had a strong feeling this would be a new favorite of ours, and we were right. It’s a guilt-free wheat bread, made with 9-grains, and is filled with fresh ingredients. We saw an opportunity to create a hearty version of our favorite sandwich and wasted no time in taking them up on the chance to upgrade our lunch game. It launched nationwide on September 4th and guess what?! We’ve already tried it and we instantly loved it. 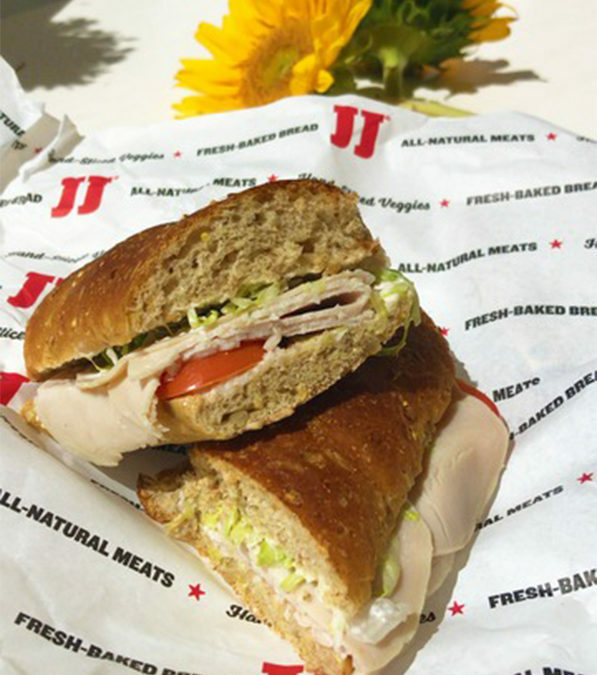 Let us tell you, this is not your average wheat sub. 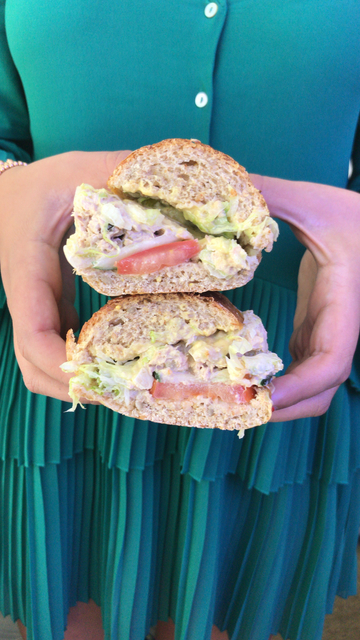 We ordered two of our favorites, the tuna, and turkey subs because we can taste the freshness, especially in the tuna since it’s made in-house from scratch every day. We put as many of the fresh veggies as could fit in between the two slices of freshly baked bread, and we were ready to go in minutes. Jimmy John’s is Freaky Fast®, Freaky Fresh®, and now, it’s freaky yummier! We love putting a spin on our classic favorites and did just that by ordering our favorite subs with their new 9-Grain Wheat Sub. Can you name all 9-grains?! Well if you couldn’t, we’ll just tell you, because you need to try it for yourself! The 9-grains included in the freshly baked bread are Rye, Flaxseed, Quinoa, Millet, Oats, Barley, Amaranth, Wheat and Spelt plus: molasses, honey, sunflower seeds, and corn meal. Not only does it completely help us step up our sandwich game, it also tastes incredible. The ingredients are high-quality and we can tell that it’s been baked fresh each day. The bread is fluffier and tastes better, the veggies are crisp and locally purchased and the meat is all-natural and sliced in-house daily; never pre-shipped or prepared offsite. If you haven’t had a chance to try it, find your closest Jimmy John’s here and be sure to try your favorite sandwich on their new bread for a wholesome spin. You can’t go wrong combining your favorite sub with freshly baked bread, and including high-quality ingredients, so you know you’re getting the best of the best. If you try the new wheat sub, comment below and let us know how you liked it!